This election has created more division in America than any I could imagine. While I try to keep my politics out of my dialogue with students, I think this era calls upon all of us to try to help students find common ground and understand each other better. As teachers I believe we must try to create positive change and promote understanding in our country. 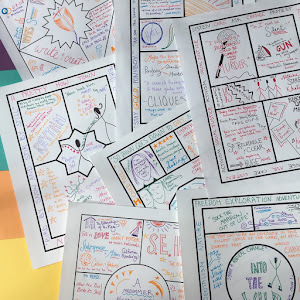 This week I grappled with the question, how could I help students to process what had just happened without attacking each other for their differing beliefs? I crafted some activities to try with students this week. Activities that help them to share their identities and beliefs, hopes and dreams for America. It's a small thing, the chance to share a bit of yourself with your classmates. But it's a place to start in the face of a very complex era. If you'd like to use these post-election resources with your students, download them for free here. Great idea! I used with my 7th grade daughter. She wanted to move to Canada! I'm so glad. I know a lot of people thinking of moving abroad. But hopefully we can find ways to come together as the people of this country and take care of each other. Thank you for offering these resources to help students process the election and to better understand each other. I like how you take lemons and make lemonade with this resource. Thank you! Thanks. It's a hard time to keep my political views to myself around students. 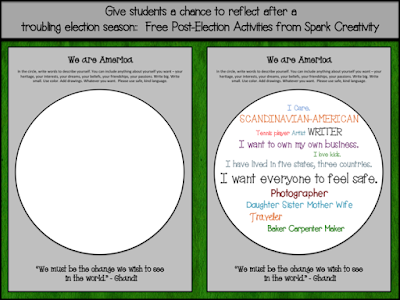 Coming up with some hope-building activities helped me cope with the election results, but I need to keep at it.